This space saving design is an eggcellent way to hold/store your eggs. 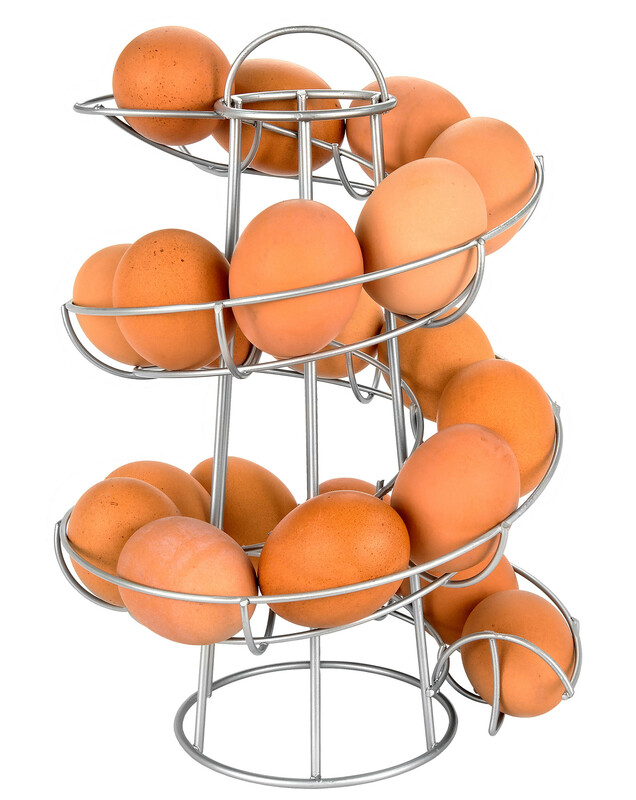 Egg Skelter can hold up to 24 eggs (but capacity varies based on the size of your eggs). Southern Homewares presents a most eggcellent way to hold and store eggs, the Egg Skelter! Made of sturdy powder coated steel, this sleek and modern space saving design fits virtually any size egg (medium, large, extra large, etc.). The Egg Skelter can hold up to 24 eggs (capacity varies based on the size of your eggs) and makes a perfect addition to any kitchen. Remember to always take eggs from the bottom and it will ensure the oldest eggs get used first! Color is silver. Egg trough is 1.90" in width. Overall dimensions are 7.50" x 7.50" x 10.63"